The 260-52202 Tipping Bucket Rain Gauge meets the specifications of the World Meteorological Organization (WMO). The design uses a proven tipping bucket mechanism for simple and effective rainfall measurement. The bucket geometry and material are specially selected for maximum water release, thereby reducing contamination and errors. 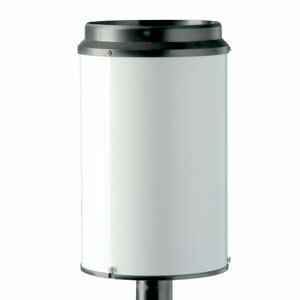 The 260-52202 Tipping Bucket Rain Gauge meets the specifications of the World Meteorological Organization (WMO). The design uses a proven tipping bucket mechanism for simple and effective rainfall measurement. The bucket geometry and material are specially selected for maximum water release, thereby reducing contamination and errors. Catchment area of 200 cm2 and measurement resolution of 0.1 mm meet the recommendations of the WMO. Extensive use of molded thermoplastic components ensures maximum performance and value. Leveling screws and bullseye level are built-in for easy and precise adjustment in the field. Measured precipitation is discharged through a collection tube for verification of total rainfall. Model 260-52202 is heated for operation in cold temperatures. Power adapter is included. An unheated version, Model 260-52203, is available for use in moderate climates.